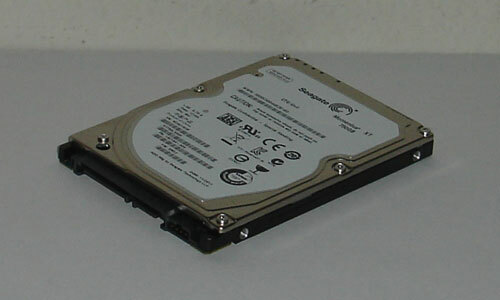 Seagate has sold over 1 million of the first generation Momentus XT hybrid hard drive. The Momentus XT was a big success that finally brought a hybrid hard drive to the market, striking a good balance of performance, price, and storage capacity. 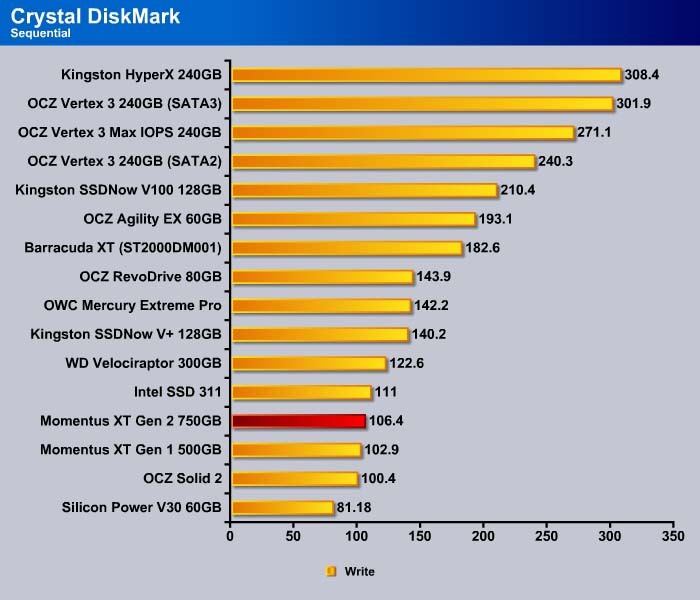 We all know that SSD’s are the undisputed leader in performance. 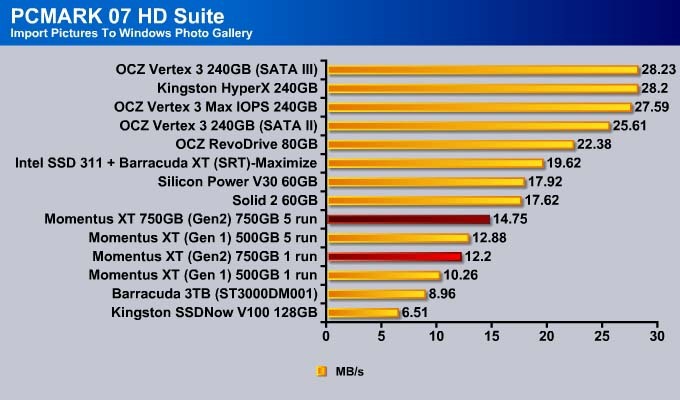 However, despite the fact that SSD pricing has been dropping significantly over the last year, it is still relative expensive at approximately $1.5-$2 per gigabyte of storage, and the price skyrockets as capacity. It is unlikely that we will ever see SSD prices fall to the range of mechanical drives ($0.05 per gigabyte). However, even if we assume pricing is not an issue, we still face the problem of storage capacity. Not only SSDs do have a lower price-to-capacity ratio, their storage capacity also pales in comparison to that of mechanical drives. 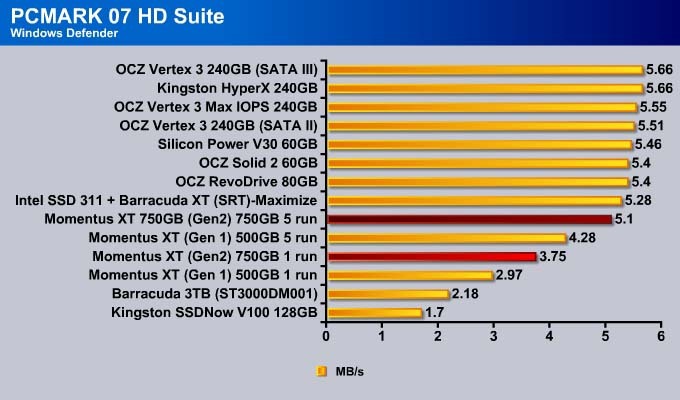 The largest SSD with native SATA interface has 1TB of storage capacity (OCZ Colossus), which is a tiny volume compared to 3TB mechanical drives. 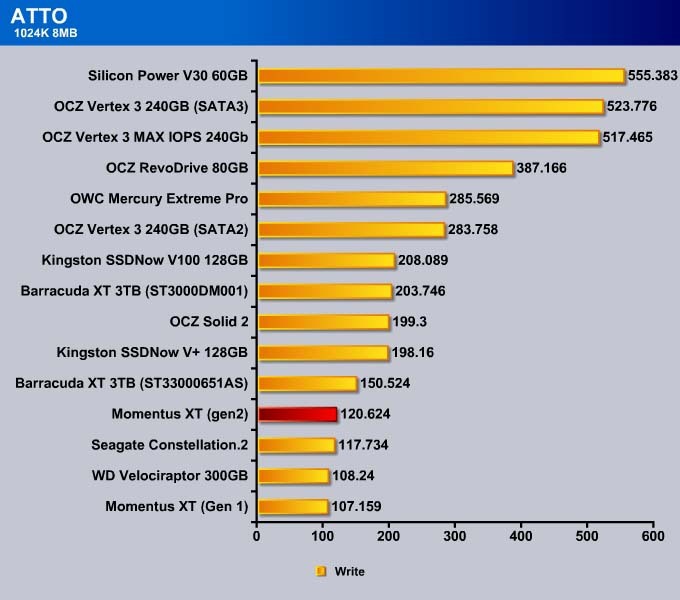 As it was, the OCZ Colossus was expensive and did not stay in the market for long. Even if we compare SSD’s against 2.5″ form factor mechanical drives, a hard drive will still offer twice the capacity of the SSD. Thus, there has been a resurgence of hybrid technology such as Intel Smart Response and Seagate’s Momentus XT that try to bring the best of the two worlds. Desktop users often do not worry about storage capacity, because most users who want the best performance go with an SSD as the main drive and pair that with a large capacity mechanical drive for storage. For mobile environments, where space limitation and portability that often will not allow addition of a second drive, the limited storage capacity of SSD’s means laptop users must choose between performance and capacity. The Seagate Momentus XT is designed to aimed exactly at the market that wants the performance of SSD without sacrificing the storage capacity. The Momentus XT bridges the two worlds by offering the performance close to an SSD with onboard NANDs acting as caching devices for the commonly used applications. 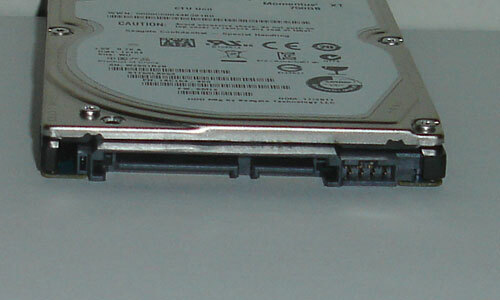 Since it is still technically a mechanical drive with a spinning platter, it does not sacrifice any storage space. As a result, users get faster boot time, quick application launching, and a speedy system while retaining the ample storage capacity offered by traditional hard drives. The first generation of Seagate Momentus XT comes with a 4GB SLC NAND chip but Seagate has doubled the NAND to 8GB for the Gen 2. It still uses SLC but Seagate did not provide any information on whether the NAND is 25nm or 32nm, or the type of the NAND used. The additional NAND should be quite useful as it can cache more data and thus, the need to access the hard drive would be even less. Intel’s Smart Response Technology has a maximum caching of 64GB and requires a minimum of 16GB for caching, so the 8GB found on the 750G Momentus XT might seem rather small in comparison. Seagate claims that 8GB is enough because it does not cache anything except commonly used files. 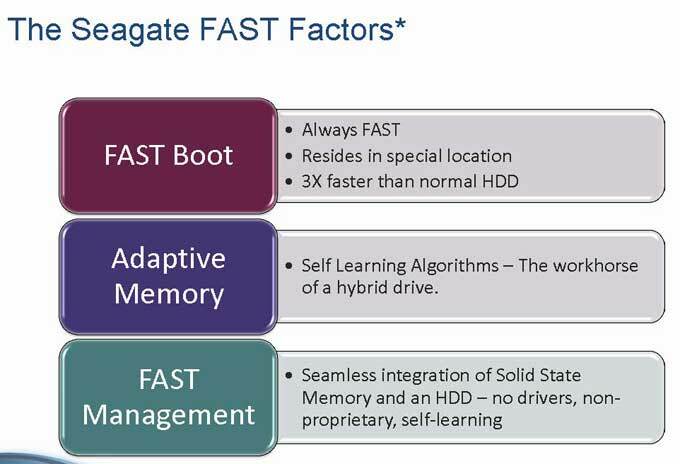 The proprietary algorithm that Seagate is using bears the branding of “Adaptive Memory Technology”. In essence, the Adaptive Memory Technology is a self-learning algorithm that is designed to monitor system usage, selectively copying data that is most frequently read and time-consuming to retrieve onto the flash. The decision is made within the controller, which is independent to the operating system or the chipset driver. The company will not disclose the algorithm used in determining what files (or codes) are being cached onto the SSD. However, they did inform us that the caching intentionally avoids HD content like AVI or MPEG files as these files are large and can very quickly occupy the 8GB NAND space available. In addition, they also informed us that it does not cache every single file needed to launch an application, as doing so can also quickly use up the 8GB of space as well. Based on what we have seen with the first generation drive, Seagate’s algorithm is rather effective at caching data to help with quicker system bootup and application launching, despite only having 4GB of space. Doubling the caching capacity should help out even further with the performance as more data can be cached. Seagate calls the idea for the integration of the hardware, firmware and high-speed NAND flash as the FAST Factor Technology. 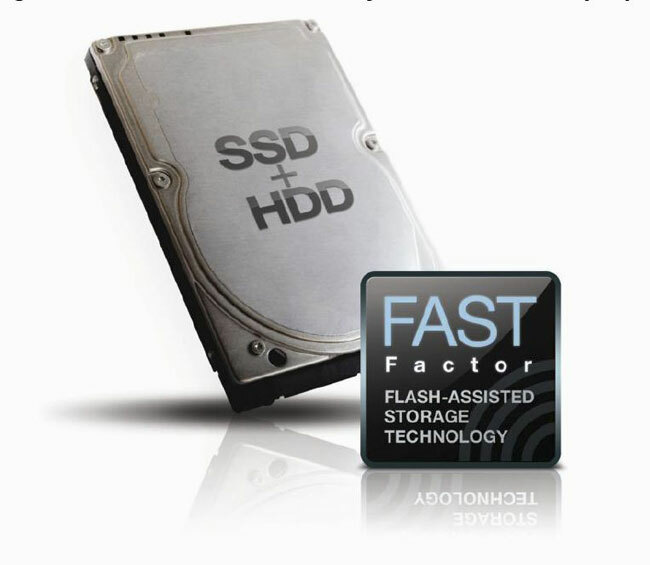 Under the Fast Factor technology is Flash management where the firmware intelligently and seamlessly manages data integrity. Since this is done via the drive’s firmware, it does not utilize any CPU power and is not dependent on any controller or OS so it will work with Mac and PC equally well. Data movement is completely done internally so it frees up the CPU usage. We were told that the new drive’s NAND has a read speed of 180MB/s and write speed of 100MB/s, which are doubled from the previous generation. Seagate’s decision to go with SLC NAND as opposed to the MLC NAND that is found on most consumer based SSDs is a smart decision. Since NAND has a limited number of write cycles, it can become unreliable once these write cycles are used up. In addition to the use of SLC NAND (which offers more write cycles), Seagate informed us that the controller will also constantly monitor the health of the NAND in order to maintain data integrity. Furthermore, data cached on the NAND will be mirrored onto the disk so in the event that the NAND is corrupted, the system will still be fully functional. 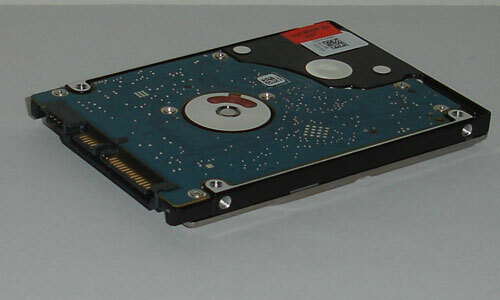 Over time, however, the drive will eventually perform more like a mechanical drive when all the usable NAND have reached their maximum write cycles. Depending on users’ usage pattern, we do not think this will pose much problem for most people as a majority of users often use 10-15 applications routinely and the data cached will probably not going to wear out the NANDs during the drive’s lifespan. The controller has also been updated on the second gen drive to support latest SATA 6Gbps interface, which should help out with the burst performance. The amount of cache remains the same at 32 MB like the first generation drive. The rotational speed is also the same, at 7200 RPM. Seagate rates the gen 2 drive to have the same average read and write time of 11ms and 13msm respectively, like the first generation drive. In terms of power consumption, the new drive consumes typical idle power of 1.1W and 3.3W seek, which is up slightly from 0.8W and 2.2 W found on the first gen drive. Finally, the new drive has also been updated with 4K sector to ensure future compatibility. It also features Seagate’s own SmartAlign technology that offers backward compatibility for the systems that do not support 4K sector drives (Windows XP or older OS or motherboard lacks UEFI BIOS). On top of these technology to help improves the drive’s performance, the Momentus XT is also backed by a very generous 5 year warranty. At launch, Seagate will be retail the 750GB Momentus XT for $245. At $0.33/GB, the 750GB Momentus XT is certainly more expensive than the average mechanical drive but it is certainly cheaper than SSD’s $1.50/GB. 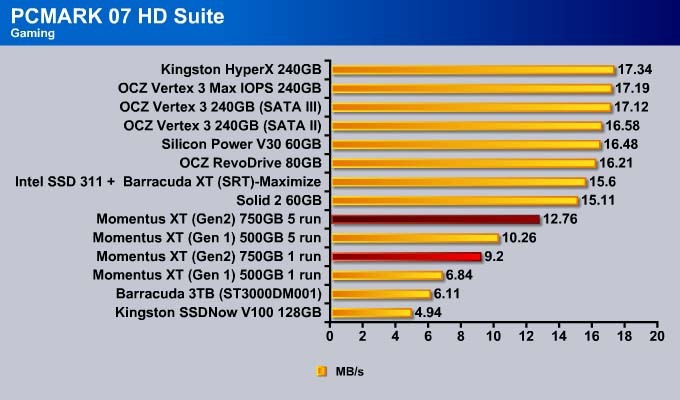 The drive is also $100 more than the 500GB previous generation Momentus XT, which was priced at $150. The pricing puts the drive right between the two common capacity SSDs–it is about $50 more than a 120GB SSD and $50 less than a 240GB. To test the Seagate Momentus XT 750GB, we cloned our test rig drive to the drives. It is the same test drive we’ve been using on all of our drive testing and is nothing more than a clean Windows load with all the drive testing software installed, as well as all the current drivers and patches for the OS. It’s the equivalent of doing a fresh load of Windows 7 from the disc but takes a lot less time and ensures that every drive tested uses exactly the same OS load and drivers. Nothing that may effect the outcome of the testing procedure can creep in. We ran all of the tests a total of 3 times and averaged those results. The Average of the three results are presented here. In the case of a pictorial benchmark we ran the bench 3 times and picked the median result. As with most SSD testing differences from run to run are minimal and the median result is a good indication of what you can expect from the drive. We ran our usual battery of tests on the drive, and used it as the primary boot drive during testing. All of the drives tested were used as the primary boot drive during testing. That’s a more realistic test than strapping the drive in and testing it with a bare format or as a non-boot drive and it represents real life transfer rates, much like you can expect when you install and operate the drive in your own system. Each test was performed 3 times and the average of the 3 test run is reported here. We start off by looking at how the new drive handles data caching. Previous Momentus XT drives required the application to be launched once before users could see the benefit from the data caching. To see if this is still true with the new drive, we decided to test the drive with a tool called Bootracer that measures the system boot up time. We installed the tool to the drive after Windows was installed without any additional drivers. Off the bat, the new drive has a much shorter learning curve than the previous generation drive. While the last generation drive requires one boot in order for the caching to kick in, the new drive’s initial boot up is the same as the successive booting time. We are happy to see the much shorter learning curve because it means that users will be able to notice the performance improvement. The higher amount of NAND write speeds is most likely the reason that we have a shorter curve. We do still believe that the drive needs the application to run at least once in order for the data to be cached but since the new drive’s NAND is able to write at 100MB/s, it has significantly reduced the time needed for caching. Good news so far. Let’s see how the drive performs after it has been fully cached. Here, we installed the chipset driver and the graphic cards driver and rebooted the system a few times to ensure that data is fully cached to the NAND. We decided to go with the higher performance 3.5” 7200RPM Barracuda XT desktop drive to provide the best case scenario as opposed to using a slower 2.5” drive. Also, rather than using Bootracer, we switched to a timer and measured the time from when we first saw the Windows welcoming screen to when we got to the desktop and the busy mouse icon stopped spinning. Here we can see that the drive improves the boot up time by 3 seconds or 14% over the previous generation drive. 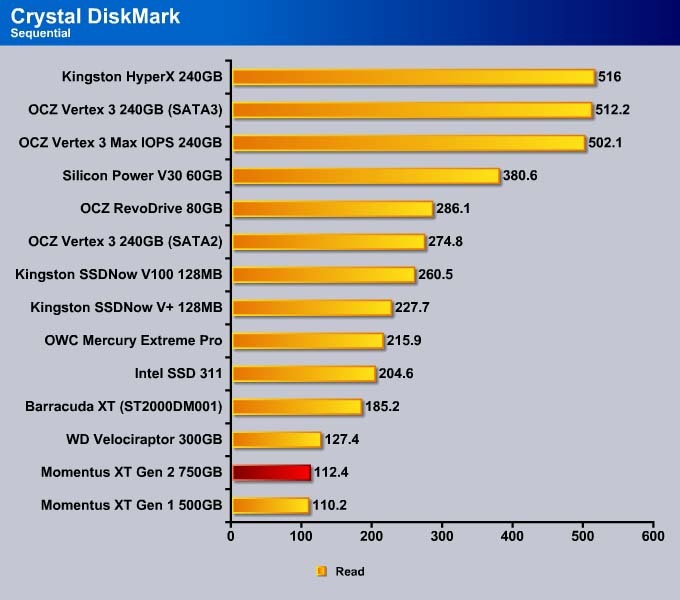 The Vertex 3 is still above the Momentus XT by 2 seconds but if we compare against a mechanical drive, we can definitely see a huge improvement–the Momentus XT is able to boot the system up at half of the time it took for the 3.5” 7200RPM mechanical to fully boot into Windows. The first set of application launching test consists of launching a 40MB PowerPoint file. 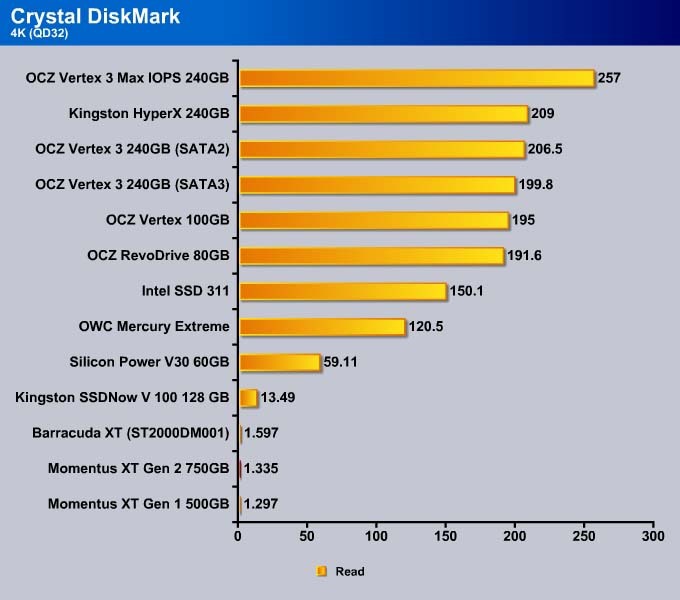 Here the Momentus XT drive performs slightly better than the Vertex 3 but honestly, the difference could very well be just random error with our timing. The take-home message is that the drive performs just as well as SSD’s, and definitely is faster than the mechanical drive by as much as 4 times. The next test consists of launching a 180MB Photoshop file. This tests puts a greater stress on the drive as a larger amount of data needs to be read and as a result, we can see that the new drive is 30% faster here at launching the application over the previous generation drive. 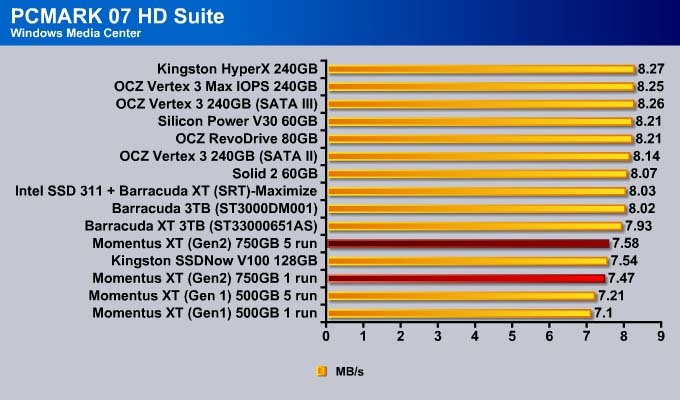 While not up to the level of SSD’s, the second generation Momentus XT is getting close and will definitely make a system boot faster. The last test consists of a script that simultaneously launches 8 applications. Here we can clearly see the benefit of the NAND caching where the new drive shed off 3.1 seconds (25%) from the previous generation drive. The spinning platter is simply not able to compete against the NAND chips when it comes to launching applications. ATTO is designed to test a mechanical drive’s performance so it will not be able to fully assess the Momentus XT’s caching performance. However, as we alluded to earlier, over time, the Momentus XT may perform more and more like a mechanical drive as the write cycles on the NAND reach its limits. So, ATTO provides us a good sense on the worst case scenario of our drive. Furthermore, it also will show us the performance of the drive where Seagate’s own algorithm prevents data not cached to the NAND and has to be accessed from the physical platters on the drive. The new drive is about 5% faster than the previous drive when it comes to random read and write. The sequential read and write has been improved by 10%. 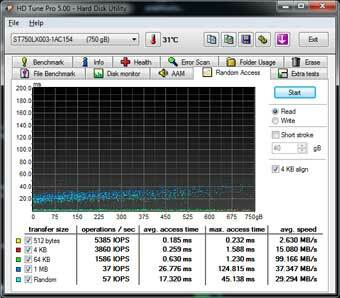 We use HD Tune to test the drive’s random read access IOPS. This test clearly shows just how much improvement the second generation drive shows in comparison to the first generation drive. 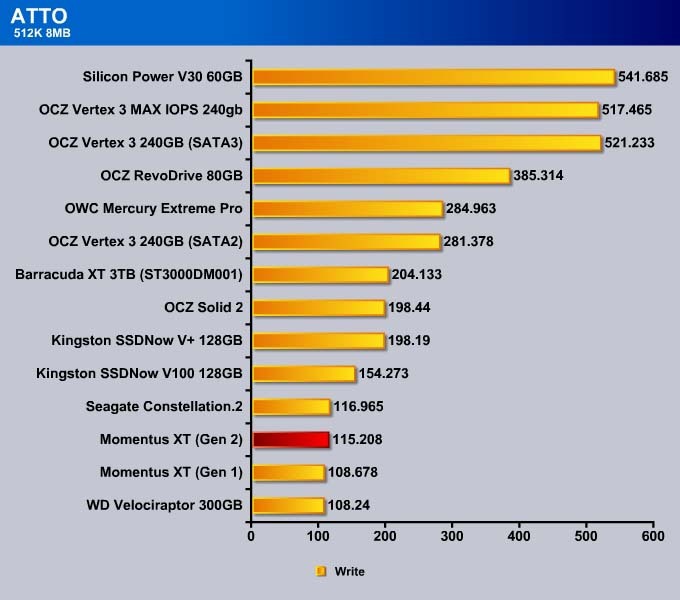 We can see that the second generation has a noticeably higher IOPS than the first gen drive. In fact, the initial run of the second gen drive has a higher IOPS than the first gen drive after the fifth run. Having much greater IOPS will to help out with application launching and as we proceed with other tests like PCMark, it will become apparent that the second generation drive even without caching can sometimes perform equal or better than the first gen drive after data has been cached. 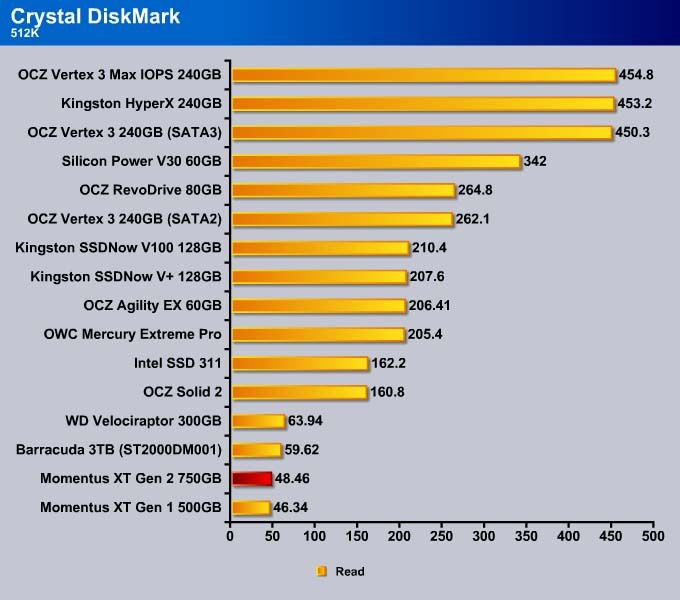 CrystalDiskMark is designed to test SSDs and like ATTO it may not be able to show us the caching performance of the Momentus XT. It is still useful to see just how the drive will handle data that is designed to take advantage of the SSD. The random read for the second generation Momentus XT is faster than the first generation but it is still not able to compete against the faster rotational speed of the Velocirapter. When comes to a mechanical drive’s random read performance, faster rotational speed always helps. It’s interesting to see that the new drive’s random write performance is actually a tad slower than the previous generation drive. While most people will not use more than a few queue depth, we include 32 queue depth to show the drive’s performance under heavy multiple use environment. The result mimics what we have seen previously. 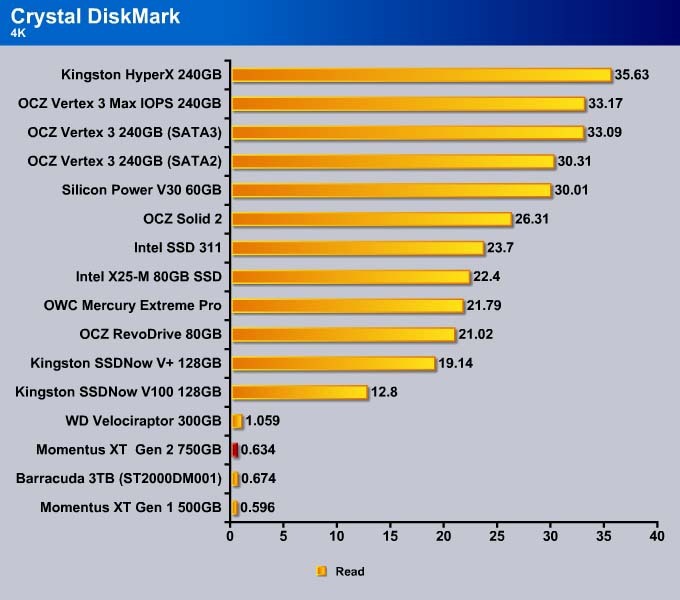 The 512K read and write for the second generation drive Momentus XT is a little faster than the previous generation drive. There’s no major difference between the two. 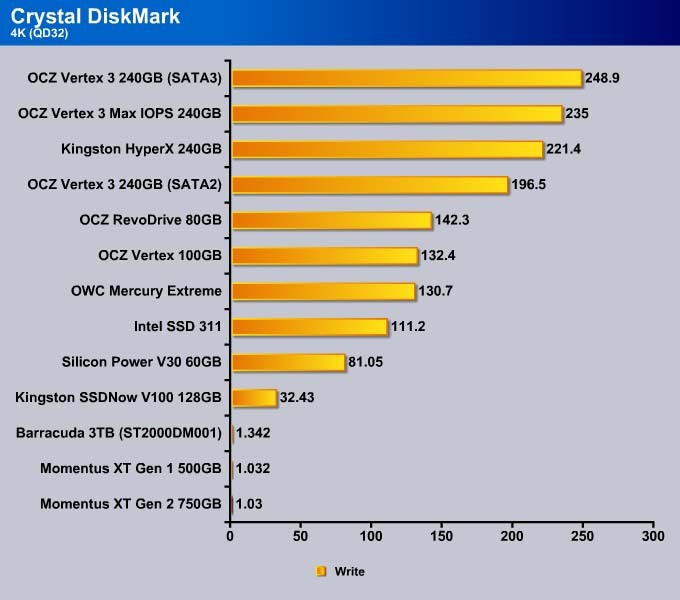 Similar to what we saw with the 512K, the sequential read for new Momentus XT is similar to the older drive. 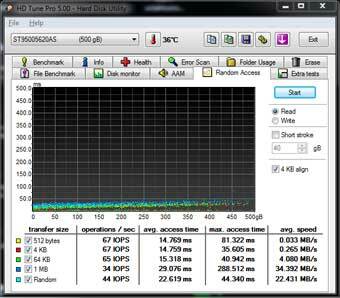 While PCMark7 is a synthetic test, it is nonetheless a tool that allows us to measure the drive’s caching performance. We already know that new drive’s physical platter performance is similar to the first gen drive, we are wondering if the double of the NAND on the second generation and the improvement of the NAND read and write speed would have any impact. Here we ran PCMark7’s HD Suite test for a total of 5 times to see the performance of the drive with and without data caching. The Overall score of PCMark 7 shows that even without data cached, the second generation drive is able to yield almost the same performance as the first generation drive after data have been fully cached. After running the application for 5 times, the second generation drive is able to gain 23% more points. Notice that that the Intel Smart Response yields a better result when we paired an SSD 311 with Seagate Barracuda XT on our Z68 chipset. Obviously, the performance of the caching depends on the performance of the SSD and we are sure that the larger capacity of the Intel SSD 311 also plays an role here that potentially caching more data onto the SSD than the Momentus XT that may selectively caching only some of the data. The Windows Defender test puts the new Momentus XT much closer to the SSD than the previous drive. 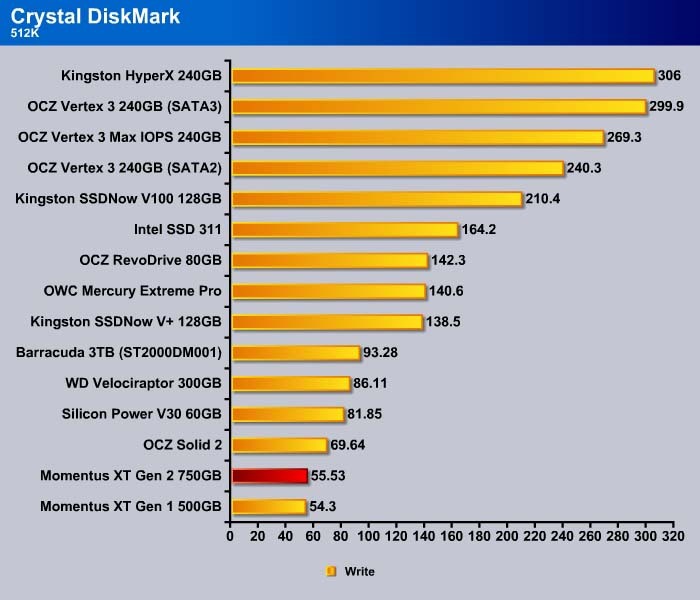 Importing pictures involves relatively small file size so the Vertex 3 has a slightly edge over the MAX IOPS. Video Editing, media center and Windows Media Player tests show only tiny improvements. This is expected since Seagate has informed us that the drive’s firmware intentionally avoids caching large HD content to prevent the 8GB NAND from being filled up too quickly. This is different than the Intel Smart Response, which seems to cache any frequently used data regardless of the type. The Application loading is where the Momentus XT shows the biggest improvements. 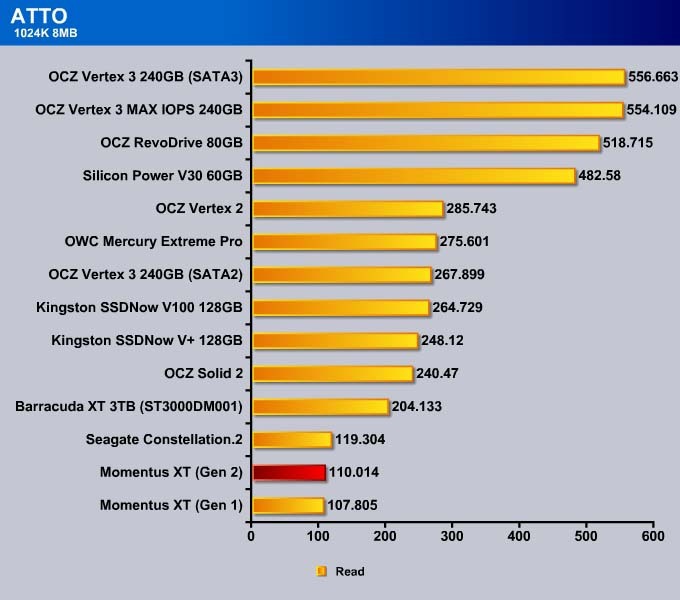 Here we can see that at the worst case scenario without any data caching, the new Momentus XT is going to be perform equal to the previous generation drive’s best case scenario. Then once the data has been fully cached, the new drive is able to improve the performance by 77%. It is still only able to offer about 1/2 of the throughput of an SSD or Intel Smart Response caching solution. Surprisingly there is an improvement when comes to gaming. We are wondering just how the faster drive has an effect on the overall system performance. 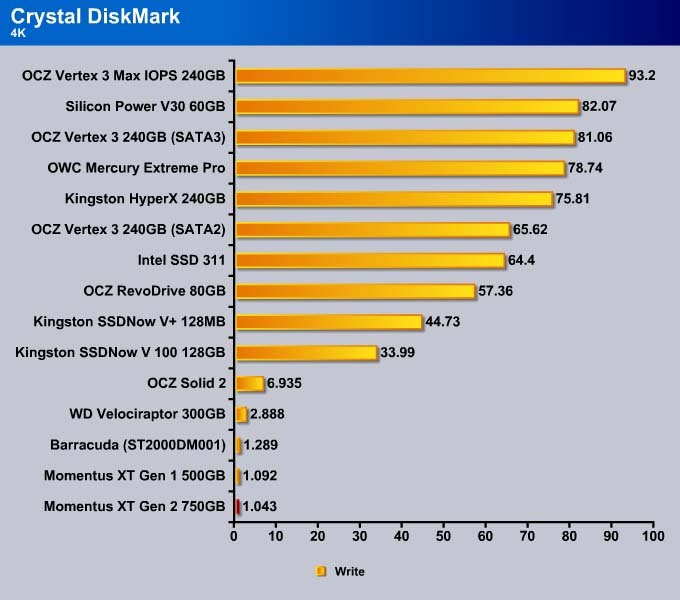 We used PCMark7 to test the overall system performance. Compared to the second generation drive, we can see an improvement ranges from 10% to 50% depending on the type of tasks. The area where the drive shows the biggest improvement is the lightweight and productivity tests. These 2 tests emphasize the drive’s random read and write performance, and clearly, having the data cached to the NAND as opposed to the slower platter has an advantage. The new drive also shows 1-8% improvement over the previous generation drive. Note, the computation is more of a pure CPU test and as a result, there is virtually no difference between the drives. The first generation Momentus XT impressed us with its ability to improve system performance without sacrificing storage space. Naturally, we had high hopes with the 750GB Momentus XT. 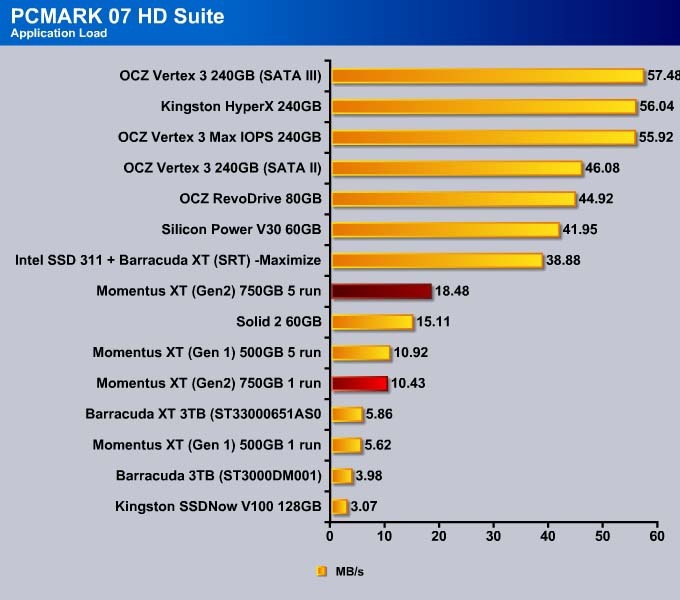 The result–the 750GB Momentus XT delivers. The updated 6Gbps SATA interface, 4K sector, twice the NAND, and improved NAND read and write speed ensures the new drive will have much higher IOPS, which translates into faster response time as it is shown with the system bootup and application launching. In our test, the Momentus XT is able to deliver 10-30% performance gain over the previous drive when it comes to application launching and system bootup. In terms of system performance as shown with PCMark, the new drive can deliver up to 10% improvements. 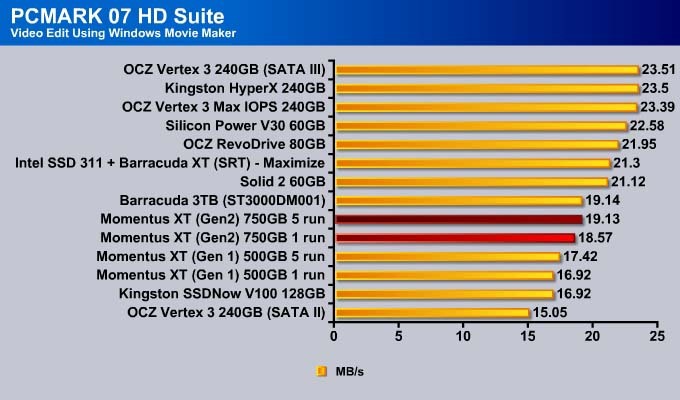 Obviously, for data that cannot be cached like HD movies and such, there is virtually no difference between the older and newer Momentus XT. 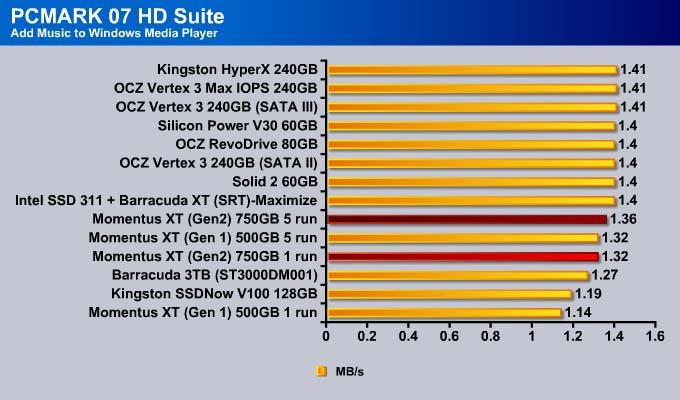 For data that can be cached, at the worst, the 750GB Momentus XT performs at the same level as the 500GB Momentus XT with data cached. And with additional caching, we can have seen as much as 20% gains in the throughput. We feel that every notebook should come with a Momentus XT as oppose to any mechanical drives. While the drive is designed primarily for notebooks, we think it can also be a very viable option for desktop systems for those who like the SSD-like performance without worrying about data management of an small SSD and 3.5’’ drive combo setup. It also offers a good performance boost for systems without a Z68 chipset to take advantage of the Smart Response. 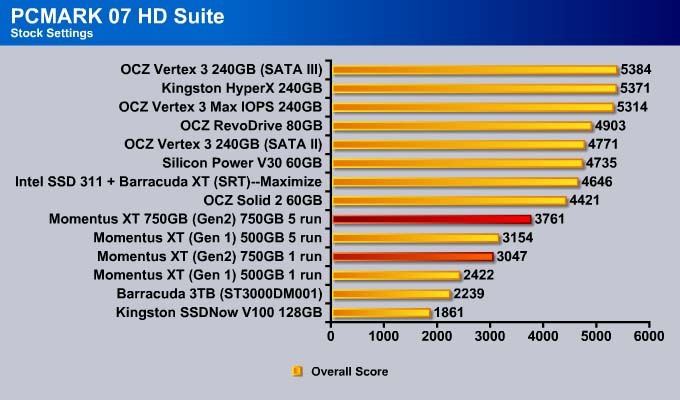 While the Intel Smart Response is still faster (provided that users pair that with a good SSD like the Intel SSD 311), it is nonetheless locked to only Z68 at the moment with X79 chipset support in the future. 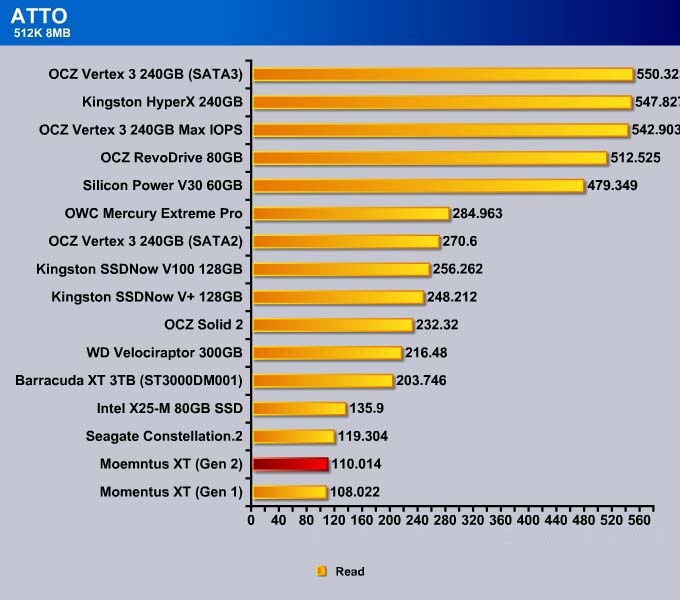 Retailing at $245, the Momentus XT is going to be in direct competition against 120GB and 240GB SSD’s. While the former is $50 cheaper, the latter is $50 more expensive. This poses a little dilemma for anyone who is looking to upgrade their system’s storage as to whether to spend the extra $50 for a much faster SSD or go with the additional storage offered by the Momentus XT while sacrificing some performance. Comparing this against other mechanical drives, the choice is obvious. For the additional $50-100, the added performance gain is definitely worth it. Ultimately, the value of the drive cannot be considered as a whole as the storage market has many segments, from those who need a fast storage drive with under 250GB of space, to those who need more storage on their single drive. For the majority of users, the Momentus XT 750GB should be a great fit, as it carries quite a bit of capacity, and matches it with the performance of 8GB NAND flash. 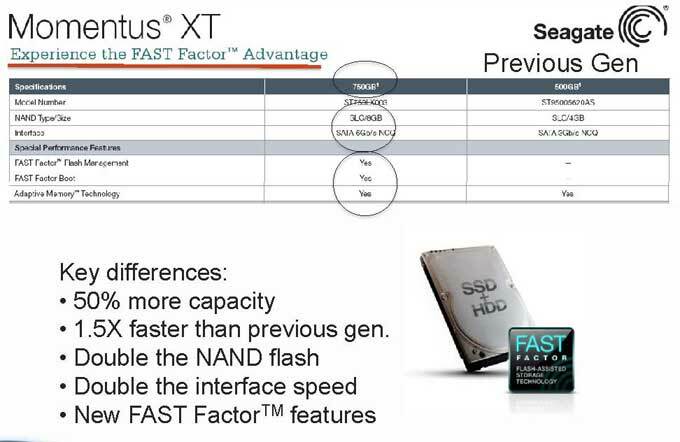 Summary: The second generation Momentus XT from Seagate delivers good performance gain, a 50% increase in capacity, and double the NAND flash and interface speed than the last generation drive. The result is impressive, and it earns the Bjorn3D Golden Bear Award.